Thousands of developers rushing to develop mobile applications of any android apps, iOS apps, windows mobile apps. 2014 Google is now number 1 most popular mobile apps companies second is iOS apps apple companies, and now the third is windows apps hold by Microsoft companies. Android Apps Developer revenue calculator is not higher than you think, According to SiteAdWiki survey most developers fail to make more revenue share by developing application because of little payouts received. Google has 5 developing Apps x 60,000 users download per apps x $0.01875 revenue bid per download = $5,625 average rate almost $6,000. Apple has 5 Developing Apps x 40,000 users download per apps x $ 1.00 revenue bid per download = $200,000 developer average rate. 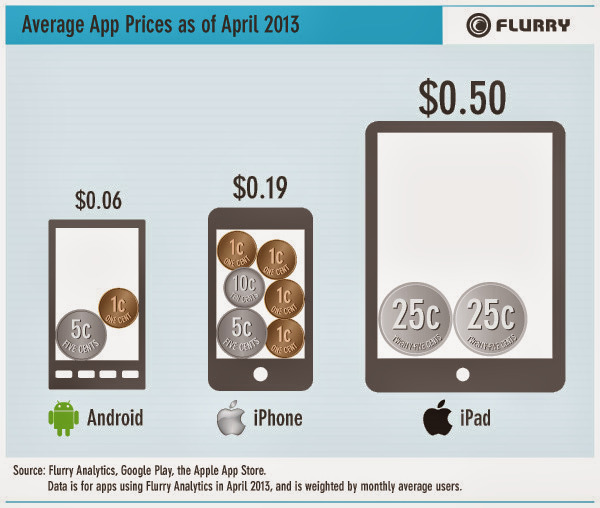 Did you notice Google has highest users downloading apps, but low app ad revenue rate while apple apps most expensive estimating developers revenue rates, But low users can afford because of expensive platform app cost per download. According to a worldwide conference last year Apple Developing Applications Conference, They talked about their developing products across world wide web almost 1.3 billions apps available applications in Apps Store, While 50 Billions Users Download but only 5 Billions Paid off. Google I/O is the largest high revenue mobile advertising network, Developing International Conference, Google touted 150,000 developers responsible for over 800,000 apps. While the company does not break out revenue numbers on their apps, recent data in their financial filings seemed to indicate somewhere around $900 million in pay-outs to developers “over the last 12 months” and discussions with external research analysts put the number of downloaded apps from the Google Play store at around 48 billion, close to what Apple has claimed. Microsoft, meanwhile, has been claiming 160,000 apps in their store from 45,000 developers. In a recent interview, Microsoft officials claimed that the average user downloaded 54 apps, which would put their download count at 650 million to date. While the company does not break out data for its mobile adnetworks division, looking at the variations in the accounts payable line of their 10-Qs over the last few quarters before and after they introduced their app ad revenue store shows a variation of up to $100 million since 2011 that could be attributed to the app store. It is clear that Apple company is winning the game , In terms of the total number of apps ad revenue and money paid to developers. But lost in the shuffle is how much money developers can actually make on those platforms.